This weekend, a friend gave me a vial of Royal Jasmine Roll-On Hanky Perfume that he picked up on a recent trip to India. Jasmine is one of my favorite notes, and this particular version is lovely. Thick and bright green at first, it dries down into a scent that matches exactly a toy I recall, but can't place exactly, from childhood. Something sweet and rubbery, something I held often, something worn. My suspicion that some of the My Little Ponies (Hasbro introduced scented ponies in 1987) may have had this soft jasmine-plastic scent led me to this perfume review which in turn led to this article about fried bubblegum "tast[ing] like My Little Pony turds." It doesn't shame me to admit that this description makes me want to try the marshmallow treat described more rather than less. 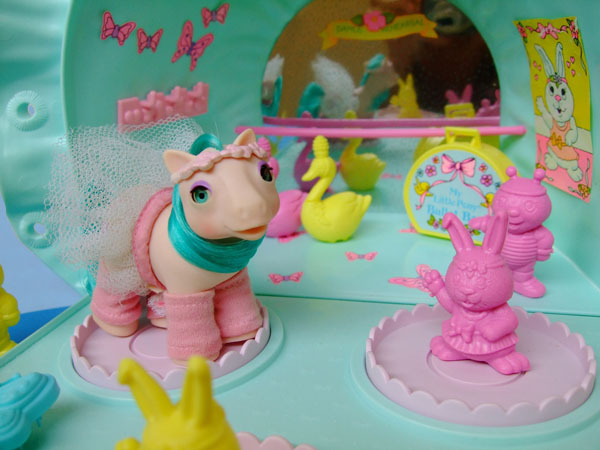 Do any readers remember a jasmine-plastic scent coming from their My Little Ponies? Or maybe you remember a different toy-of-the-80s having a jasmine aroma? I wish I could send a little puff of what I'm sniffing through the screen, so you could smell exactly what I mean, see if it transports you, too. Oh, you are young. I am old. Strawberry Shortcake dolls were the only scented toys I had. But I, too, would like to taste a My Little Pony turd. Maybe not while pregnant, but someday. Good luck on your search, lady. I never had a My Little Pony, but those Corolle dolls smell like vanilla (not that I had one of those either, and I refuse to buy one for Rumika). I wouldn't mind having a jasmine-scented toy, though. For myself, not for her. Oh boy, this might be the first spam on Nosy Girl. Not bad, robots!